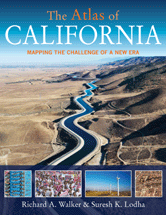 Editor/Author Walker, Richard A. and Lodha, Suresh K.
This indispensable resource gives readers the tools they need to understand the transformation as California attempts to forge a new identity in the midst of unprecedented challenges. California's geography sets it apart from the rest of North America. Its natural blessings have been a source of wonder and wealth, its frequent earthquakes a challenge. Half of California's land is in public ownership, and much of that is protected in the most extensive system of national, state, and local parks in the United States. California was part of the Spanish Empire, then Mexico, before being annexed to the United States. Native peoples were annihilated by Spaniards, Mexicans, and Americans alike, through forced removal, slave labor, disease and massacres, and are still struggling to regain their rightful place in state life. California is the most populous state in the United States and for decades was among the fastest growing, due to high immigration and birth rates. For centuries, California has been a magnet for migrants, both domestic and foreign. They have come from many places in search of a better life, escaping poverty, war, famine, and persecution—but often facing hostility on arrival. California has the highest number of unauthorized immigrants of any state. Although their presence is controversial, several industries depend on them to fill low-wage, low-skill jobs. Democracy in California has long suffered from unequal representation, a weak party system, and the power of money in elections. But voting patterns are solidly Democratic have become more so in recent elections. California has the largest budget after the federal government but has suffered budget shortfalls, revenue volatility, and reduced taxation, resulting in huge cuts during the recession and making planning difficult. Tax revenues constitute roughly half of the general revenue of California state and local governments. Two- thirds of expenditure goes to education, health, welfare, and safety. California is the most militarized of states. It has been a strategic intellectual and technological center for the military, and served as the Pacific base of operations in several major wars. California's prison population and funding for corrections have soared in the last 30 years, even though violent crime rates have dropped. The US Supreme Court has ordered a reduction in the state's prison population to reduce overcrowding. California's economic growth has long outpaced the rest of the country. With its vibrant and diverse industrial tapestry, it is a model of economic innovation and prosperity. California's prosperity has been built on its workforce, both in numbers and quality. Labor demand and supply, skills, and wages have long exceeded the national average, feeding the state's remarkable growth. California is home not only to globestraddling corporations with large management teams, but also to thriving small businesses and start-ups. It has long been the second-largest center of finance in the country. California's agribusiness is one of the agricultural wonders of the world, leading the country in the variety and quantity of output, and setting the pace for modern farming and food production in the United States. California is known around the world as a leader in technology and innovation. It has offered highly favorable conditions for innovators to flourish and put new ideas into play. California is highly urban, and the state's cities and metro areas are among the nation's largest, densest, and most economically significant. San Francisco has long been world famous but is today part of a large, complex urban region: the Bay Area- high-tech capital of the world and richest big city in the country. Los Angeles is California's largest city and the country's second largest metropolis. It is popularly known for its remarkable growth, sprawling landscape, and mixture of peoples, but is equally a manufacturing and transportation powerhouse. California runs on real-estate development. The scale of building is huge and property values high. After the greatest real-estate bubble in history in the 2000s, the state suffered a devastating crash. California has one of the most advanced transportation systems in the world, including highways, airports, seaports, and railroads. The challenges of city commuting are great, as are those of handling an immense flow of goods, within and beyond state borders. Northern California has abundant rainfall and the Sierra a large snowpack; excess runoff is stored and moved south to supply agriculture and cities in the southern half of the state. Water use exceeds natural supply in many parts of California, especially in drought years. Water conservation has checked the growth of consumption, and it must continue. California has one of the lowest rates of energy consumption in the United States. Fossil fuels, mostly foreign and domestic imports, dominate energy supply, despite efforts to develop alternative sources. Total electricity demand has been rising in California due to overall growth plus inland migration. Yet higher prices, government policies, and technical change have kept per capita electricity consumption flat over the last two decades. California is a leading producer of renewable energy, but the goal of significantly increasing the share of electricity generated by renewables faces many obstacles. Global climate change is being felt in California in the form of rising average temperatures and sea level, weather extremes, and more wildfires. The implications for water supply, flooding, and ecosystems are potentially grave. California is a national leader in reducing carbon emissions through transportation planning, industrial controls, and the use of renewable energy, making it one of the lowest emitters per capita of greenhouse gases in the United States. Although California has made dramatic progress in reducing air pollution, a majority of the population continues to breathe air that poses significant health risks. California's surface, ground, and coastal waters suffer serious contamination from farms, cities, and industry, jeopardizing health, recreation, and wildlife. Toxic chemicals pose risks to the public and the environment. Good health depends greatly on access to and quality of healthcare, on health behaviors, socioeconomic conditions, and physical environment, which vary widely across California and create persistent disparities between places and racial/ethnic groups. Healthcare costs have been rising rapidly, burdening families, employers, and governments. Yet California ranks towards the bottom in per capita health spending, as well as in state Medicaid support, employer-based coverage, and percentage of uninsured. Despite its leadership in introducing a variety of early childhood education and support programs, California provides preschool access to only half of its three and four year olds, and quality access to even fewer. California's once-heralded K-12 public education system today ranks near the bottom in student achievement, graduation rates, student-teacher ratio, and per-pupil funding. Greatly increased investment and commitment are needed to put public schooling back on a sound footing. California's public universities, vital engines of economic and civic life, are in danger of failing to provide affordable access to quality higher education. Can California rediscover its former commitment to public higher education? Income and wealth inequality have grown significantly in the last 30 years, fueled by stagnant wages, rising assets values and corporate pay, as well as federal tax relief for the rich. Poverty is rampant in California despite its wealth and prosperity. Millions of Californians go hungry every day and tens of thousands are homeless. This is one of the worst records in the nation. Government food assistance programs that help mitigate hunger need to be strengthened. Homeless people have little institutional support and often face hostility. California enjoys a rich mix of people of different races and national origins, just one of four states where minorities are the majority. Yet the participation of people of color in politics and business is much less than that of Whites, and almost all suffer disproportionately from low incomes, poor health, and less education. California's record of gender equity is good in education, moderate in wages and political representation, and poor in business. The state has been a pioneer in the struggle for gay rights, but has suffered setbacks on the question of equal rights to marriage. California's young and old suffer disproportionately from deprivation, and many are ineligible for government benefits because of inadequate measures of cost of living and need. California's glory resides in its prosperity but, in the face of multiple challenges, it needs to forge a new identity. Data must be selected and interpreted with caution because of the challenges presented by inconsistency, omissions, imperfections, and underlying assumptions.